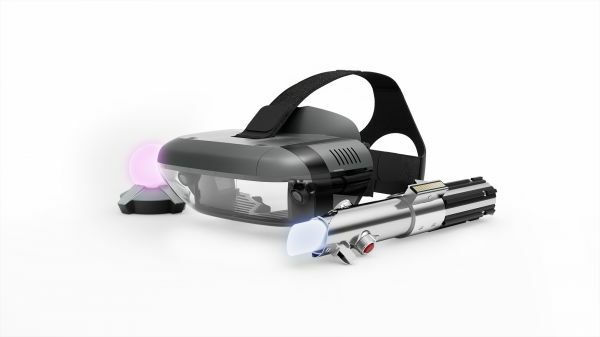 Lenovo Mirage AR headset gears you up for lifelike lightsaber battles. Buy this Lenovo Star Wars AR console here at Souq.com.Call forth your inner Jedi with the Lenovo AR-7561N Star Wars Jedi Challenge Console. Take on some of the most menacingly phantom villains in the Galaxy and perfect your lightsaber skills, just like Kylo Ren and Darth Vader. Pull a fast one on your enemies in the ultimate game of concentration and strategy. You can direct your holographic alien pieces across the board while battling out for territory on checkered game tables. Stand tall as a leader of Rebel forces against the Empire in insanely epic and large-scale ground wars. A battle-hungry army is at your disposal as you build out your strategic outposts to hold your ground against the forces of the Empire. This Lenovo Star Wars AR console lets you experience what it feels like to wield a lightsaber for the first time so that you can have a showdown against your enemies right in your living room. Feel the backlash of your opponent's attacks with force feedback. This Lenovo Mirage AR headset is ergonomically constructed for maximum game immersion. The high-caliber beacon ensures accurate tracking of your location. It expands and fills in the environment around you with a lifelike augmented reality universe.